With over twenty bartenders participating, there was a plethora of unique cocktail choices. My own favourites were Mike Crispo‘s (Soho House) Crisp “Hard Italian Soda”, consisting of Campari, carbonated water, blood orange juice, rosemary, acid phosphate, and sea salt. This mix of blood orange, rosemary, and salt tickled the sweet, bitter, and salty taste buds at the same time. I also enjoyed drinking the cocktail from a bottle, which was sealed, cooled, and then unsealed when it was ready for serving. Another personal favourite was Andrew Hunter‘s Butterface, which paired perfectly with The County General‘s crispy pigs ears from Chef Adam Alguire. 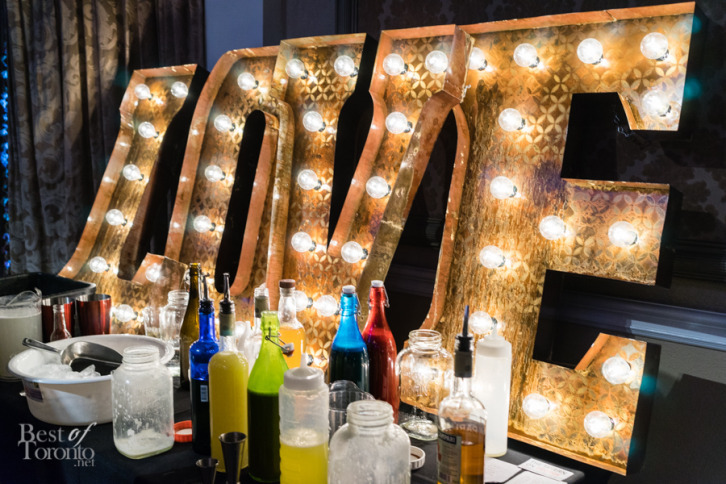 As North America’s largest mixology competition, the Made With Love Toronto finals lived up to the billing. For just over three hours, guests enjoyed the wide variety of cocktails from some of the city’s top bartenders, and the delectable bites to pair with them. Congratulations to all the winners, and we look forward to seeing them compete at the Made With Love national finals to be held in Toronto on May 25, 2015 at Everleigh. Also check out our coverage from Made With Love’s previous competitions in 2014 and 2013.